The Greatcoats - legendary heroes, arbiters of justice . . . or notorious traitors? The Greatcoats are travelling magistrates bringing justice to all . . . or at least they were, before they watched the Dukes impale their King's head on a spike. Now the land's heroes are reviled as traitors, their Greatcoats in tatters. Facio, Kest and Brasti have been reduced to working as mercenaries, but when they find their employer dead - and are forced to watch as the killer plants evidence framing them for the murder - they realise things are about to get even worse. For the royal conspiracy that began with overthrowing an idealistic young king is spreading to Rijou, the most corrupt city in the land, and the life of a young girl hangs in the balance. 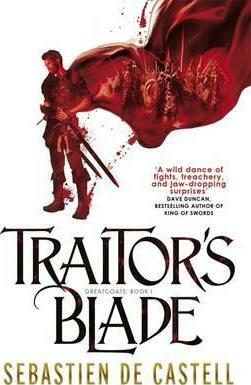 When every noble is a tyrant and every knight is a thug, the only thing you can really trust is a traitor's blade. Sebastien de Castell had just finished a degree in Archaeology when he started work on his first dig. Four hours later he realised how much he hated archaeology and left to pursue a very focused career as a musician, ombudsman, interaction designer, fight choreographer, teacher, project manager, actor and product strategist. After a year in the Netherlands, he has recently returned to Vancouver, Canada, where he lives with his wife and two belligerent cats.